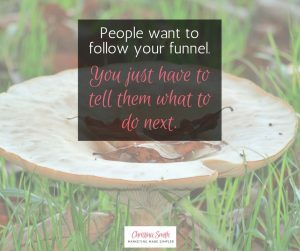 Want your tribe to follow a funnel? Always tell them what to do next. Ok. You invest in a fancy website, you set up all your social media and consistently post, and you may even get a ton of followers. 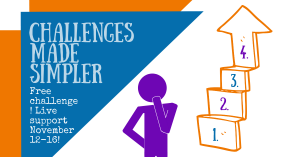 Yet when it comes to sign-ups or purchasing, you still are struggling. Now with the money and time you’ve invested, you’re wondering why people aren’t signing up for your awesome goodies and courses. One problem could be that you aren’t giving them a direct path to follow. You may be giving too many choices. When we offer too many choices, the prospect isn’t being led down the path you really want them to follow. You have to be specific (without being pushy) about what you want them to click on or be interested in next. If you have a funnel built out (check my post “Woo Your Tribe with a Profitable Funnel“), it’s time to go back and check that you haven’t offered too many choices when it comes to getting to the next step. The maximum choices should be two and I would only offer those in the big ask – the offer that you really want them to purchase but may be a bit of an investment. For example, a sample funnel. Social media is at the top of the list. 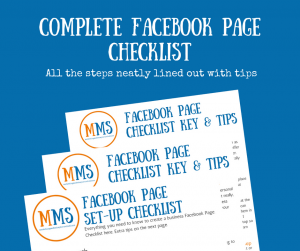 So first you attract them with great content and maybe they like your social pages. Then you offer content like a blog post. In that blog post, you need to tell them what to do next. “If you like this, here’s your next step.” Usually it’s about getting them on your list. The important thing is — even if you have several freebies they could sign-up for, you are only offering the one you want them to follow on this path. Then they get the freebie and at the end of the freebie, you tell them what to do next. “Want to learn more? I have the secrets to x, y, z in this special webinar (or recorded video or special content). After they watch the webinar there’s an option for a low cost buy-in. There aren’t additional options to “join my group” or “like my social media” or “fill out this form”. There is only one choice – this button to keep going on the path we put them on. They may buy – they may not. You still have their email so you can serve it up to them again if they don’t. If they do buy, you give them your offer at the end – the big offer that you really want them to take and is in line with the other content they’ve been following. Whatever the path is, make it direct. There is nothing worse than too many choices. They can often distract people into following no path rather than directing them. I’ve personally been there before where I went to buy something and there were so many choices, I ended up walking away without a purchase. In everything you write, every piece you put together it’s always good to ask yourself why. What is the call-to-action I want them to take? Figure out how each piece of your work and content is related to your funnel and give them the next step. People want to follow a path. Make it clear and easy. Want to build a path but need a little assistance? Let’s chat it up. Contact me.